Don’t get me wrong, passion plays an important role in your career; it can be used for rallying others around an idea, and it’s the energy shot we take at 11 p.m. when the project is due at 11:59 p.m., but it’s not the be-all end-all path to success. Following your strongest emotion without regard for consequences prevents you from forward momentum because eventually, you have to deal with the consequences you ignored. The problem with expressions like: “follow your passion,” “follow your bliss,” and “do what makes you happy” is that they are short-sighted. Passion is purely self-fulfilling. Your passion can only make you happy, not others. Purpose, on the other hand, includes others in your happiness, creating a happiness network and a positive feedback-loop. When you follow your purpose, you are happier and a better employee than following your passion alone. It’s a Catch-22, because you are happiest when you make other people happy. Some of you might be calling B.S., but I have data to back me up on this. I’m going to call on two different studies—one by Adam Grant, Wharton’s top-rated professor for seven years in a row, and a second study conducted by Morten Hansen, professor at UC Berkeley (former professor at Harvard Business School), who co-authored Great by Choice with Jim Collins (THE Jim Collins who wrote Good to Great). In the first study, Grant was curious if lifeguards would be more engaged at work if they identified their passion or their purpose in their work activities. To do this, paid lifeguards at a community recreation center were divided into two groups, a Personal Benefit Group (passion) and a Task Significant Group (purpose). Each group spent 30 minutes reading and discussing four stories. The Personal Benefit Group read stories about how other lifeguards had benefited from the skills they gained on the job. The Task Significant Group read stories about rescuing drowned swimmers. A month later, Grant checked in with the lifeguards’ supervisors and asked if anyone voluntarily signed up for more hours. Next, he asked the supervisors to rank the individual lifeguards’ helping behavior (defined as “actions taken voluntarily to benefit others”) and compared the results to a survey he had them fill out before the experiment. Obviously, controls were in place to prevent supervisors from biasing the results; they didn’t know which group each lifeguard was part of. The results heavily favored the Task Significant Group, with 43% more hours voluntarily worked and a 21% increase in helping behavior. The Personal Benefit group showed no increase in helping behavior. Keep in mind, the behaviors were observed a month after the 30-minute story and discussion intervention. That’s all it took for the Task Significant Group to recognize their purpose in their job to inspire them to work more often. And when they were at work, they were more likely to go above and beyond to help pool visitors. [D]o not follow your passion. My research suggests that is wrongheaded advice because it can lead you down a path of no career and no money. 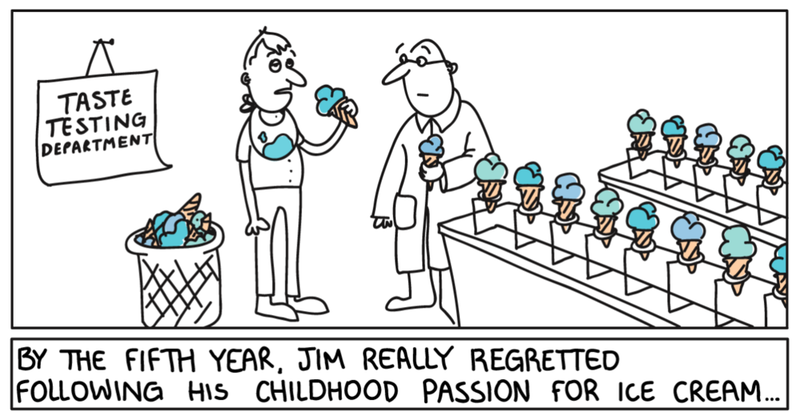 … Yet, the opposite approach, ignoring your passions, doesn’t seem like a great idea, either. A third alternative we found in our research is, match your passion with a strong sense of purpose. That means finding something you love doing that also creates value for others. Both passion and purpose are important, but operate differently. Use passion to stay motivated and purpose to keep it in check. Having a passion is energizing, but raw unchecked emotion doesn’t produce efficient results. Just as pure gasoline doesn’t burn unless it’s kept going by the wood that fuels it, passion will burn out if it doesn’t have a purpose. There are other reasons to connect your work to purpose. If you strong-arm your way through a project by following your passion, you may achieve what you set out to do, but if you didn’t include anyone in the process, chances are, no one is going to want to buy your product or services because you didn’t factor others (like your customers) into the equation. Passion is 100% selfish because your passion is uniquely yours. My passion is definitely not your passion, and vice versa. When you connect to a purpose, you connect to something larger than yourself. Even though your work is stressful and the hours are long, at the end of the day, you feel fulfilled because you did something that mattered. Next week, we’ll look at how purpose, skills, and money fit into projects outside of your full-time, like side hustles and dream projects.